Águila Solitaria made his professional debut around 1976 after training under Hércules Flores and Tom Mix. After them there were groups in Arena Mexico in which he learned from Super Halcón, El Faraón, Gran Cochisse, and Águila India. Moreover when he was at El Toreo he was trained by Angel Blanco and Blue Demon. He was looking for a ringname to remember and his fondness for birds inspired him to chose the ringname of Águila Solitaria (Solitary Eagle) adopting a winged mask. The mask designs were of his own. The early design was very detailed; it included the eagle's talons and feathers during his first years of career. One day he lent one of his masks to a then rookie Atlantis because his mask was ripped off and he had no spare masks. When Águila saw Atlantis wearing his mask from far and he noticed that many of his mask details such as the snakes, talons and feathers could not be seen from far and the mask shape did not looked like the one of a bird. Then he decided to modify his mask in a more simple way just leaving the wings and the eagle's head making his mask design recognizable from near and far. The winged black and silver mask that became his trademark. During his first years of career he was wrestling in the independent circuit particularly at Arena Ajusco. He held a longtime rilvalry with Vulcano which led to an epic lucha de apuestas in which Aguila Solitaria won his first mask. On 1978 he joined to EMLL he had to start from the bottom. He met again with Vulcano continuing with their rivalry. They used to participate in what was known as Lucha de Botana (also known as Lucha de Desempance) which is an extra match after the main event with the purpose of avoiding congestion at the exit. People could either left or stay. These kind of matches were performed by those wrestlers who were in the preliminaries. One night Aguila Solitaria and Vulcano went in an extra bout in which Roberto Rangel was the referee and they gave a great match that all the crowd stayed to see them. On the following day all wrestling magazines published that the Lucha de Botana was the best of the night. Aguila Solitaria was considered probably the most promising rookie of the 80's. Broke out in 1981 by making a nice very good record of victories in apuestas matches which put him on the map. One of the most difficult apuestas match he had was against Zagan. In fact the match was delayed for weeks by the commission due to the brutal matches they had previously. The mask vs mask against Zagan was bloody and one of hardest that Águila Solitaria could ever have. On July 19, 1987 Águila Solitaria won his first championship when he defeated El Simbolo to win the Mexican National Welterweight Championship. Águila Solitaria defended the title several times, against wrestlers such as El Supremo, Leon Chino, and Bestia Salvaje. On September 3, 1988 Aguila lost the title against Bestia Salvaje in a rematch. After losing the Mexican National title Águila Solitaria began chasing the NWA World Welterweight Championship, whose champion was Fuerza Guerrera at the time. On June 2, 1989 Aguila Solitaria defeated Fuerza Guerrera to become the Champion until Fuerza Guerrera regained the title in a rematch on September 21, 1989. Popular enough for CMLL to create a mini, Aguilita Solitaria. Águila Solitaria teamed with Ciclón Ramírez and Pantera II to form a trio known as Las Saetas del Ring ("The Arrows of the Ring") they won several state trios championships such as the Nuevo León Trios Championship and the Veracruz Trios Championship. The also won the Distrito Federal Trios Championship from Los Tarascos in 1991. One day he received a draw from a fan as gift. In that draw he was portrayed with an eagle on his arm. He not only liked the gift, he also got an idea. He learned falconry and adopted and trained an eagle which he named Jaty. He used to take Jaty to the gym and the arenas in he presented. Was an instant hit thanks to his ring entrance where he would bring Jaty with him to the ring and allow it to fly all over the arena before his matches. Obviously this led to some situations where the eagle would refuse to return to his master. There was a time that Fuerza Guerrera was so upset with the eagle because he believed that Jaty got all the attention. Tired of this situation, before the match started and during Jaty's fly he attacked Aguila Solitaria taking off his glove avoiding Jaty to return to his master. There was another time in which he went against Cuchillo who used to bring a blank firing rifle and shoot. Cuchillo made his entrance shooting his rifle and scaring Jaty who flew away hiding in the arena. Águila had to look for Jaty after the event. Sometimes Jaty helped his master. There were situations in which Aguila was beaten by his opponents when he lift his arm, Jaty went to help him. There was a time Jaty attacked Jerry Estrada. 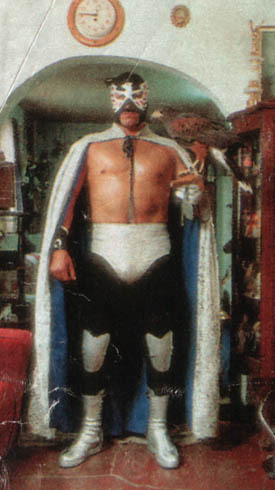 There was a time in which Mil Máscaras refused to accept a ride from Águila Solitaria, because Mr. Personalidad was too scared of his eagle. Jaty was Aguila's companion for 31 years. Others tried to copy de idea of bringing an eagle to the ring but they failed, because they did not know about falconry. He refused at first to take part in the mass exodus of talent to AAA in the spring of 1992. Five years later he left CMLL and went to the Independent Circuit. Antonio Peña approached to him and convinced Aguila to join AAA. He made some quick appearances from mid 1997 until early 1998. After AAA he went back to the independent circuit. Currently he wrestles with his son Aguila Solitaria Jr. on the independent circuit. 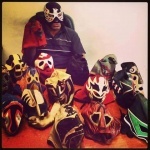 Aguila Solitaria began to train new generations of wrestlers. All began when he decided to train his son. Aguila asked for an schedule at Gym Mr. Fortis. Aguila always trained there, besides he and Mr Fortis were good friends. When he was training his son more trainees joined. Aguila Solitaria believes that in order to write good pages in the history of lucha libre it is important to have good basis and starting from the bottom. This page was last edited on 21 September 2018, at 12:05.